Mrs Johnson doesn’t like a fuss, but we couldn’t let this very special occasion go by without a celebration. Mrs Johnson will be 80 years young on Easter Sunday. 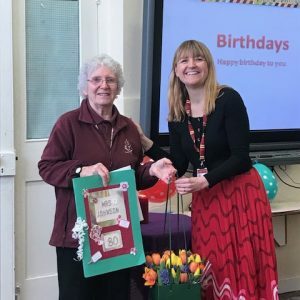 She has worked at Dame Tipping since 1970 and is a much valued member of staff who contributes so much to school life. I’m sure you’ll agree that Mrs Johnson has so much energy and enthusiasm for her work here. She loves being with the children and says that’s what keeps her young! 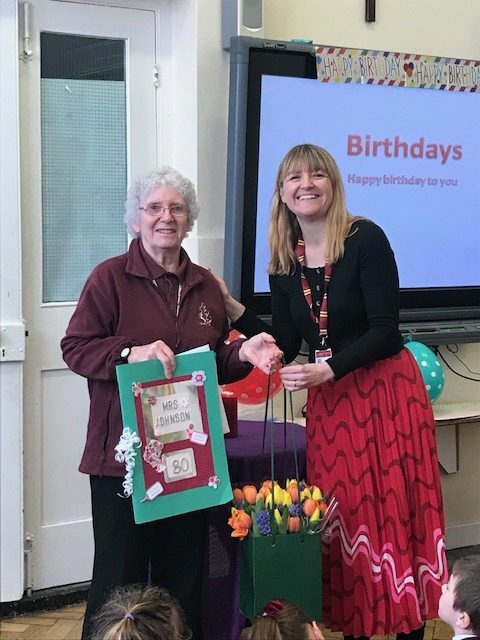 I would like to thank Mrs Johnson for all that she does and hope you’ll join me in wishing her a very Happy Birthday. Children in KS2 had the chance to pitch their inventions to 3 ‘dragons’ on Tuesday afternoon. In computing, Class 3 and 4 have been creating interactive toys and using ‘Scratch’ to make online simulations of their toys; Class 5 and 6 have been designing Wellbeing Apps aimed at children their own age. The dragons were impressed with the children’s presentations and their computing skills. Great work, KS2! I had the pleasure of accompanying a group of Year 1 and 2 children, along with our sports coach Mr. Nunn to a 3 Tee Cricket tournament at Rainham Cricket Club yesterday. The children played very well and the scores were very close. Year 1 won their last match against St. Patrick’s. I was so proud of the children’s attitude and their behaviour. We also had lots of fun! Thank you so much for your generous support of our Lenten appeal this year. Thanks also to all the children who organised Lent Games. We raised £380 which will cover a year of school for our girls in The Gambia, Bintou and Fatoumata. The children should wear their summer uniform after the Easter holiday. Please remember that this no longer includes a polo shirt. Children may wear short sleeved shirts with their ties, shorts or a yellow school dress or playsuit (school uniform style). Please note that white cardigans and sandals are no longer permitted. When the sun comes out, children will need their school baseball caps whenever they are outside, so please ensure your child has a named school cap in school every day. Reception/Year 1- Charlie Lockwood for his fantastic reading progress. Class 3/4- Oscar Knight and Poppy Whitcombe for putting a lot of effort into writing their excellent adventure stories. Class 5/6- Emily Harris for a well-planned and informative presentation on autism. Reception/Year 1- Amna for being so caring to her friends and Jake Allen-Moss for always trying his best in all his activities. Class 2- Blake, for showing kindness towards others and helping his friends when they were hurt. Class 3/4- Fern Collins, for being very helpful to others. Class 5/6- Kai Boorman, for being a good role-model, a good friend and an amazing reader. Congratulations to Aaron Hick for achieving his Stage 7 swimming award. Well done to Leah Moss for gaining a gold star award for her tuition sessions. Congratulations, also, to Sapphire Hagon for achieving 93% and a distinction for her recent singing exam. Ella and Emily Murch had the opportunity to attend a training day with West Ham and scored lots of goals ! Congratulations to Elena Marshall who was awarded the Headteacher’s Award for ther perserverance and determination and for living out all of our core Christian values. Well done, Elena ! I would like to wish you all a peaceful Easter break. I hope you have lots of opportunities to spend quality time with your families and friends. I look forward to seeing all the children back on 29th April, well rested and ready to learn.